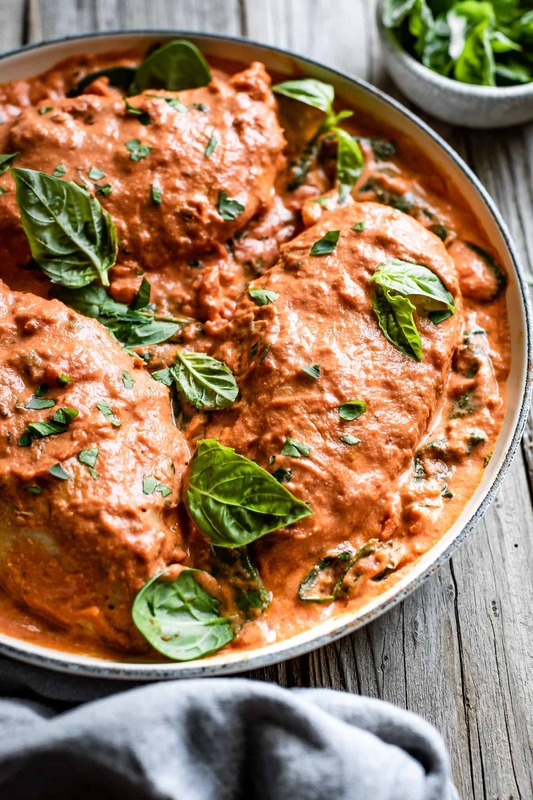 Creamy roasted garlic tomato basil chicken with spinach. 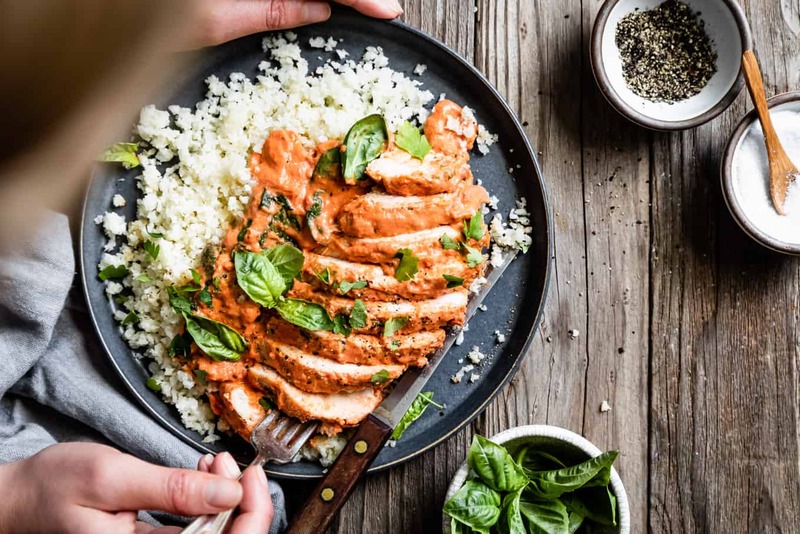 This easy Whole 30 chicken recipe uses roasted garlic cashew cream mixed with a jar of flavorful tomato basil sauce for a quick weeknight dinner! Serve it over cauliflower rice with fresh basil. This post is sponsored by Lucini Italia, using their organic tomato sauce. 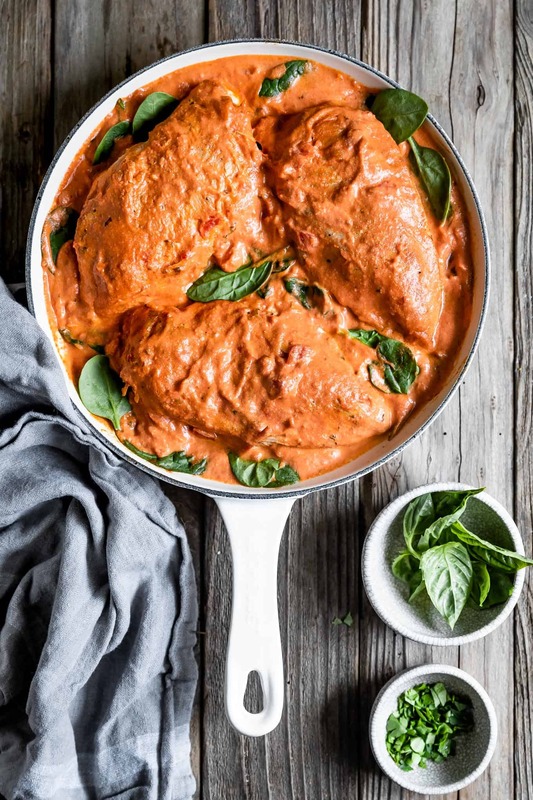 We’ve started weaving in some Whole30 recipes into our dinner menu, like this creamy tomato basil Whole30 chicken recipe. 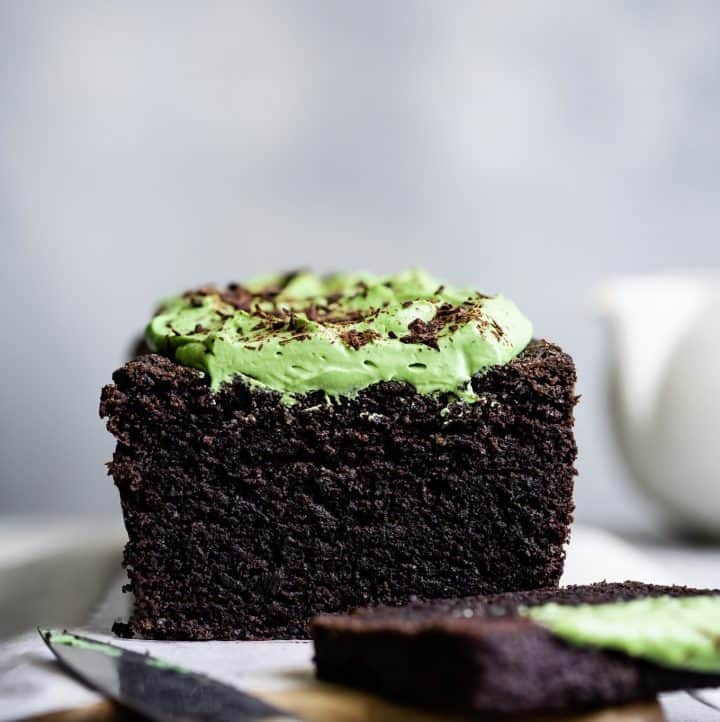 If you’re a regular on my blog, you’ve likely heard about my approach to food before – in our house, we eat real food and indulge with moderation. I don’t believe in guilt and I’m not a fan of fad diets or eliminating foods all together (allergies being the exception, obviously), but I am one for generally eating healthier. Adding in Whole30 recipes a few nights a week without grains or added sugars works for us. I realize we’re missing the 30-day piece of Whole30. 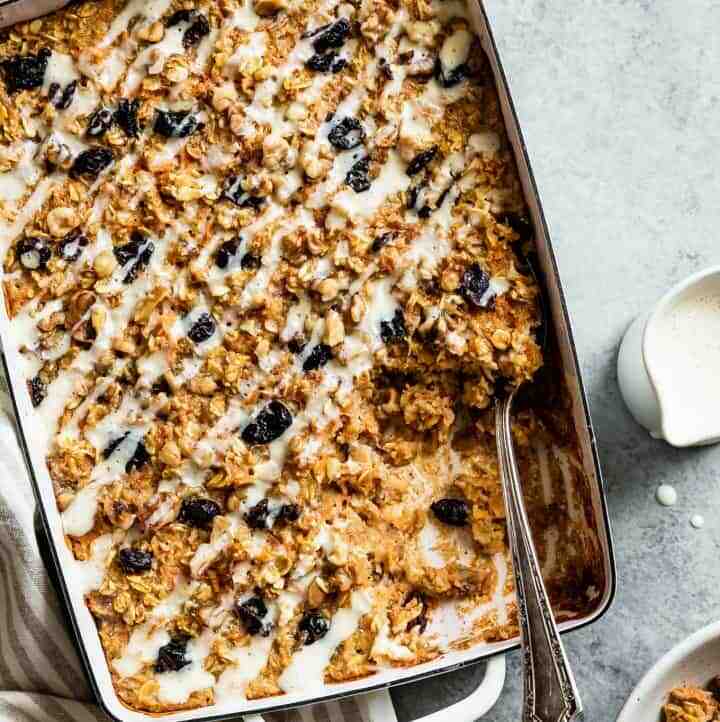 If you’re doing the entire 30 days, then great – this recipe is perfect for you! You do what works for you and your family. I base my personal approach to food on my own trajectory toward becoming a happier person. I seem stuck in the throes of postpartum depression – it’s been brutal this time around. I’m ready to make changes and I’m on a journey back to a place where I’m happy, where I love myself, and where I love my body. A couple of weeks ago, I confessed on Instagram Stories that I hate exercise. I always have. So many of you replied with encouraging messages (thank you!). Plenty of folks suggested that I need to find exercise that I like, but I’ve tried…and tried…and honestly, for a couple of very random health reasons I won’t go into in detail here, I just don’t like the way I feel while exercising, no matter what activity. Sure, I definitely should be kind to myself because this body birthed two children, but I think much of my happiness is trapped in all my clothes that don’t fit and the extra chin that shows up when I smile in pictures. I don’t feel happy – both on the inside and the outside – and I’m hopeful exercise can help with both. So I literally googled, “what to do if you hate exercise?” And I decided that I need to build a habit of exercise before I set any big time goals. When I think about running for 30 minutes every day for five years, it seems impossible, so I put it off. Instead I’m starting with the goal of putting on my work out clothes and running for 5 minutes a day. My brain can handle that. So far it’s working – I’ve run (or danced) every day since then, each time lasting at least 15 minutes when my goal was just 5. I’m coupling the exercise habit building with those healthier eating choices I talked about above. 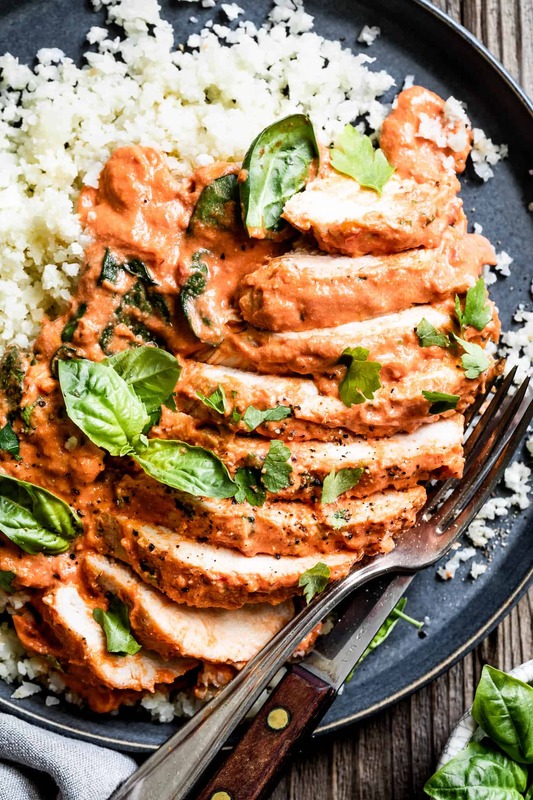 When dishes come out as delicious as this creamy tomato basil chicken and spinach over cauliflower rice, it’s an easy choice. It’s all about the sauce. 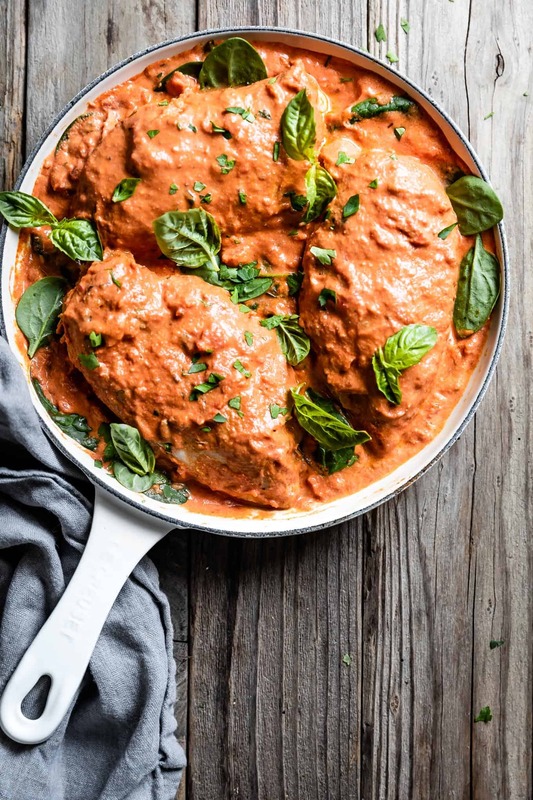 This creamy chicken recipe is simmered in a creamy roasted garlic tomato basil sauce that is completely dairy free. 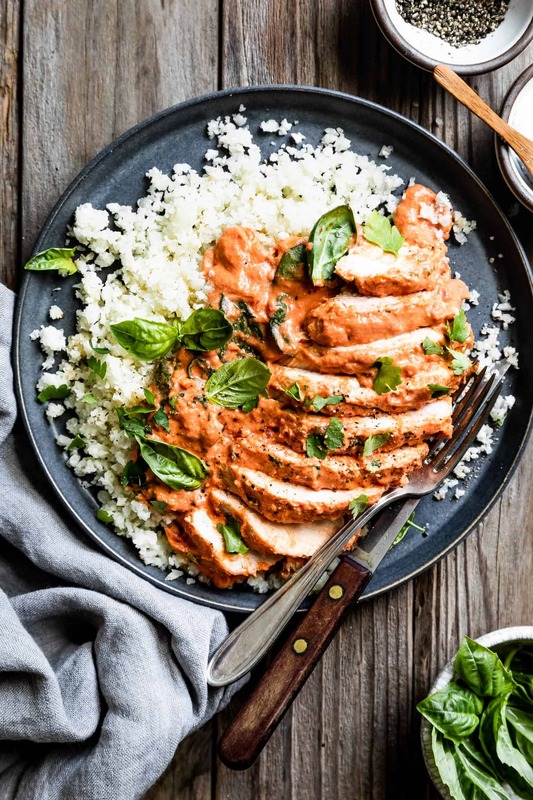 Instead, the tomato basil chicken sauce gets its creaminess from homemade roasted garlic cashew cream sauce. I’ve folded that with a jar of Lucini’s organic rustic tomato basil sauce for a super easy weeknight dinner that has layers of flavor. 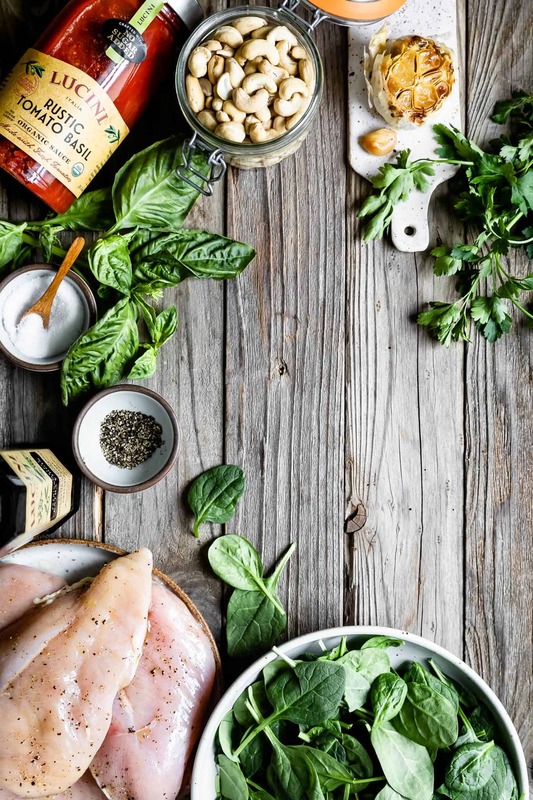 The seasoned organic Lucini sauce tastes like it’s been simmering for hours, only you don’t have to do that part! 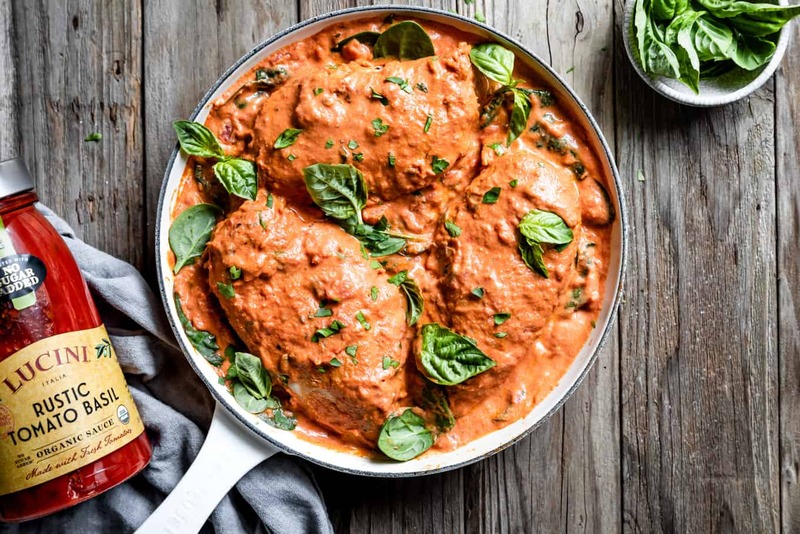 For this creamy tomato basil chicken recipe you can use boneless skinless chicken breasts or thighs – your choice! To cook boneless skinless chicken in a skillet without ending up with dry chicken with a thick burnt crust, start it on the stove and finish it in the oven. Season it well with salt and pepper, then give it a good sear to brown the outside of the meat. Quickly pop it in the oven to cook it all the way through. This method retains more of the juices from the chicken. It also cooks the chicken more evenly without it developing a thick dry layer on the outside. 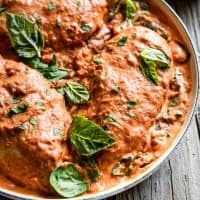 Transfer the chicken to a plate then mix and heat the sauce in the same pan with the spinach before nestling the chicken back into the pan to coat. To keep it Whole30 approved, serve the chicken and sauce over cooked cauliflower rice with plenty of fresh herbs on top, as I’ve done here. If Whole30 isn’t your thing and you’re just looking for a delicious chicken, it also goes great spooned over pasta. Is Olive Oil Whole 30 Approved? Lucini’s is! Using Lucini’s tomato sauce and olive oil keeps this recipe Whole30 approved. 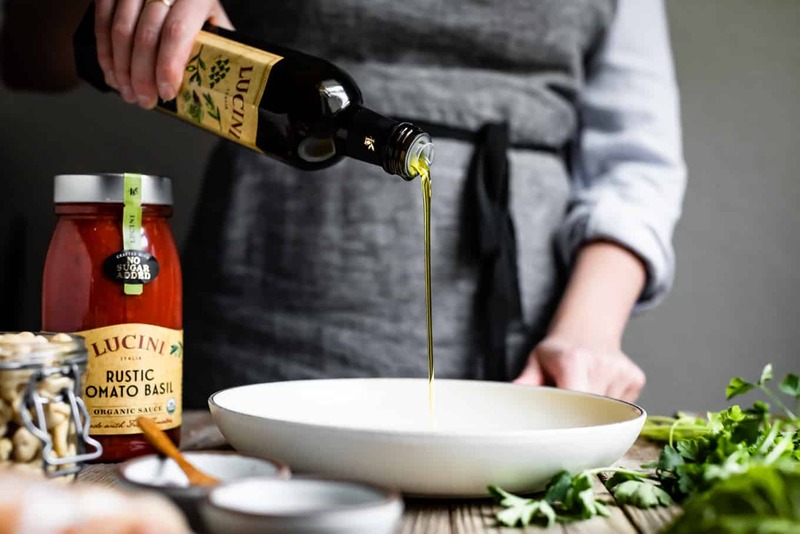 Both Lucini Italia’s organic sauces and olive oil just received Whole30 certification. The Lucini Italia extra virgin olive oil is the first and only Whole30 approved olive oil on the market. Disclosure: Special thanks to Lucini Italia for providing the ingredients for this recipe and sponsoring this post! And thanks to you for supporting the companies that keep Snixy Kitchen cooking! If using just cloves, rub them in olive oil and wrap them in foil. If using a whole head, slice off the very top 1/2-inch of the head and pour a teaspoon of garlic into the garlic. Wrap the head in foil. Place the garlic in the oven and roast for 30-45 minutes, until beginning to turn golden brown and soft. Meanwhile prepare the chicken breasts. Pound the chicken until it's an even 1-1½-inch thickness. Sprinkle both sides of the chicken with salt and pepper. In a large oven proof skillet, heat 2 tablespoons of olive oil over medium high heat. Add the chicken breasts and let sear for 2-3 minutes until it begins to brown and lifts easily from the skillet. Flip the chicken and cook for an additional 2 minutes. Transfer the skillet to the oven alongside the garlic and let cook for 13-20 minutes (depending on the size of your breasts) until the thickest part of the breast reads 165°F on an oven thermometer. Remove the skillet from the oven and transfer the chicken to a plate, leaving any juices behind. Meanwhile, prepare the cashew sauce. Add the three cloves of garlic and a pinch of salt to the blender or food processor with the cashews and water. Blend until completely smooth and creamy. 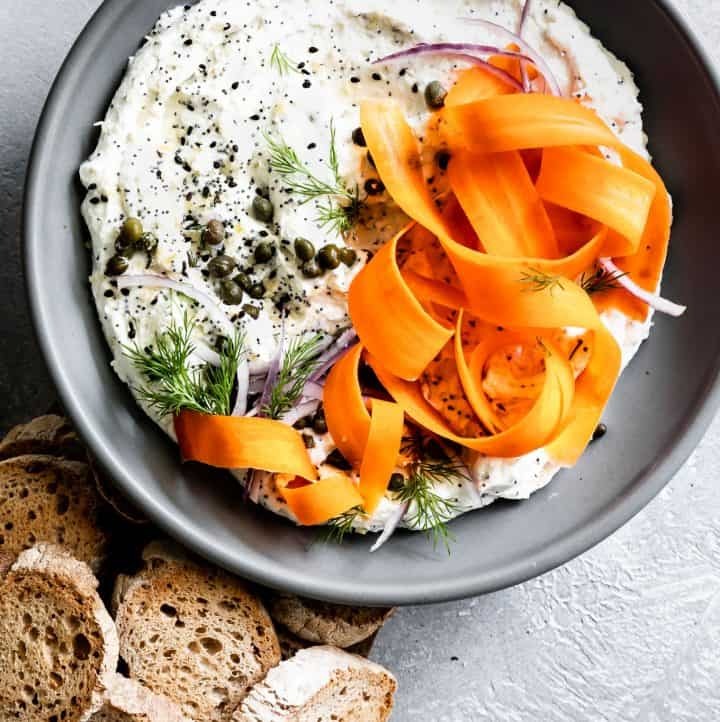 If you had to double the cashew cream, remove half and save it for later. Heat the same skillet you used to cook the chicken over medium heat, add the jar of Lucini tomato sauce and the roasted garlic cashew cream. Clean the jar of the sauce out with 1/4 cup of water and add that to the pan as well. Bring to a low simmer, stirring until completely smooth. Add the spinach and toss it gently to wilt for 1-2 minutes. Nestle the chicken back into sauce, covering it completely. Garnish with fresh basil and, if using, parsley. Serve over cauliflower rice. 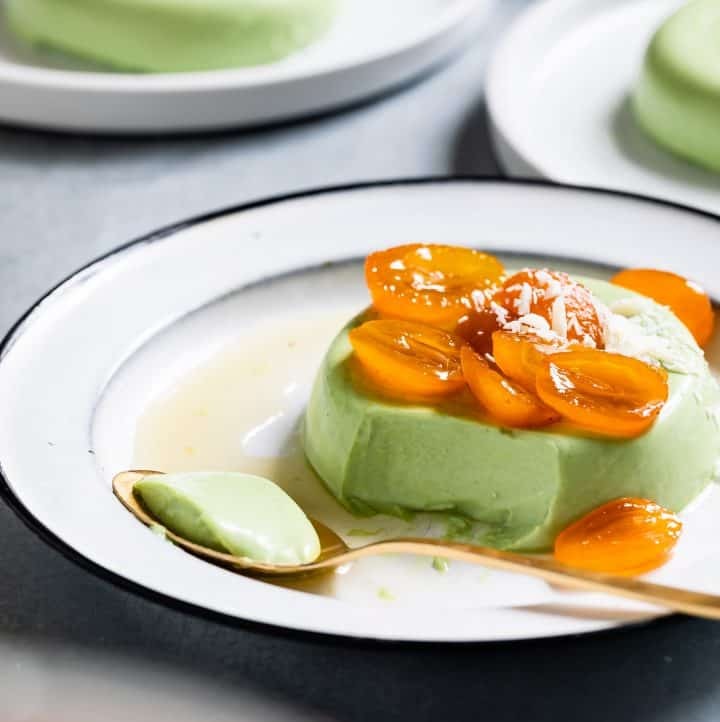 Hi Snix, I love your blog and aspire to make many of the extraordinary recipes you share. I feel compelled to reach out and share with you that I too suffered post partum depression and it was also partly due to my body image. We know the physiological reasons we gain weight… we can concentrate on how essential is it for a healthy pregnancy, labor, and birth. And sure there’s much about the birth of baby for feeling gratitude; but that doesn’t help us fit into our jeans again. We still desire to express our individuality, our sexuality, and the essence of who we are apart from being a Mom. May I humbly suggest and support you in taking all the time you need to perhaps reconnect with your inner-self; and rekindle the love in your heart for the beautiful Devine being you are as you navigate this. As a mom of two young women, I eventually found a peace in better accepting (the aging process) more gracefully that which is not mine to control. May I say with love in my heart, you are lovely in your skin as it is, and will be 💗 … and please forgive me if I have overstepped. Oh, I’m so sorry to hear about the PPD. I didn’t realize it at the time, but absolutely had it when my first daughter was born and then again, and very bad, when she started to wean. It can feel so overwhelming and awful, so I hope your support system is there for you. And, always, I’m here for you too. I’d be happy to chat, and listen, anytime. Sending love! This dish, and your approach to incorporating Whole30 meals a few times a week, is wonderful. This is just the kind of thing we make for family dinners, and I can’t wait to try it out.